The 2019 May Day Show will be held on May 4 & 5 from 10-5pm! "Injecting Creativity into your life and work"
You select a date and time to book a private class. 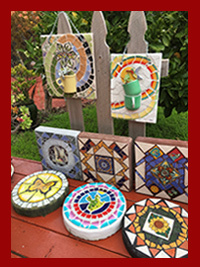 From a large and colorful selection of plates and tiles you can choose to make either a Garden Stepping stone or a Wall Hanging. The versatile wall hanging can also include a ceramic cup for a succulent starter. This is an open studio drop-in workshop for mosaic artists. 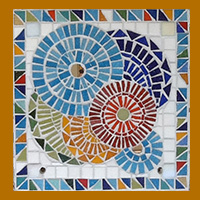 You will be able to use the indoor or outdoor studio space to create your own mosaic projects. The studio time fee includes use of mosaic tools, adhesives and grout. If you have taken a mosaic class at the Painted Chair Studio or are familiar with the mosaic process, you can enjoy an afternoon of self-directed time creating mosaics. No instruction will be offered at this workshop. Bring your own supplies or purchase, at very reasonable prices, supplies from the studio. The supplies available at the studio will include everything you need to complete a project. 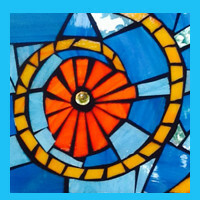 In this class we will use stained glass and glass tiles to create a "stained glass" style mosaic that can be displayed in a window. This class is designed for both new and experienced students. We will be working with glass cutting tools, and wheeled glass nippers. Using the mosaic pieces, you will create your design on a framed piece of clear glass, using adhesives and grout to complete the project in class. Instruction and the use of tools will be given at the beginning of the class. From a large selection of glass tiles, glass beads and stained glass you will bring out the luminous beauty of your project. You can complete a flower pot or a wall hanging. The wall hanging will be your own creative design. You can choose to add a mirror for an artful and functional mosaic! With instruction in the use of glass tile nippers, glass adhesives and grout, you will complete this colorful project in class!